I think Autumn is finally here! And we should celebrate with soup. 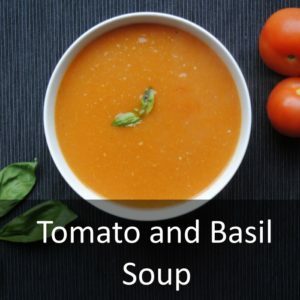 There is no soup more comforting than a classic tomato and basil soup and this is my recipe that I have perfected after cooking it for the past 15 years. This is my favourite soup ever. I have been eating it for years. I’m pretty sure I was bottle fed it as a baby ;). There is something just so comforting about it and it always makes me feel better. I remember eating my Grandma’s tomato soup from a young age, and then eating my Mum’s variation of that soup for years after and when I started cooking for myself, this is something I always wanted to master. It will never be as good as my Mum’s, but she also thinks that hers is not as good as my Grandma’s. If that is the way it goes, then my kids would have no hope at making this soup! My Grandma never put garlic in her soup, as my Granddad didn’t like it, so when my mum made it, she put garlic in it, and some parsley too. I wanted to put my own little variation on the soup and haven’t followed the family recipe exactly, so I put in LOADS of garlic (can’t get enough of the stuff) and some basil too, as it is the perfect partner to tomatoes. Adding a grilled cheese sandwich to this soup makes it a really tasty and filling lunch or dinner. 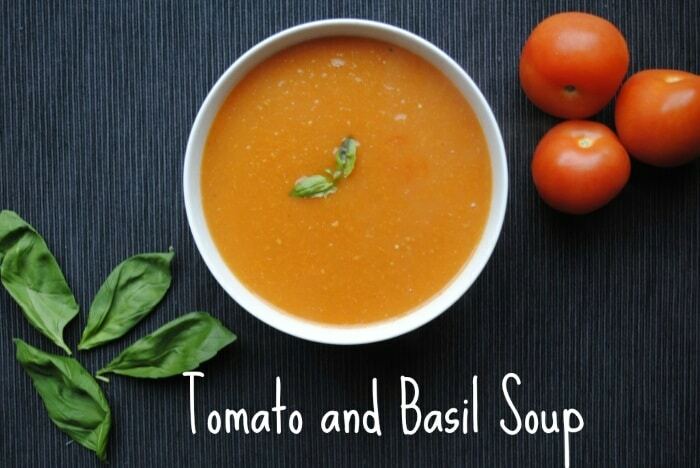 Do you want to be kept up to date on more delicious posts like this Tomato and Basil Soup? Please subscribe to the blog mailing list (it takes 30 seconds). If you’ve tried this Tomato and Basil Soup or any other recipe on the blog then let us know how you got on in the comments below, we love hearing from you! You can also FOLLOW US on FACEBOOK, TWITTER, INSTAGRAM and PINTEREST to see more delicious recipe ideas, behind the scenes shots and also what we are getting up to. There is no soup more comforting than a classic tomato and basil soup and this is my recipe that I have perfected after cooking it for the past 15 years. Chop all of the vegetables and put in a large soup pan. Add the water and basil and season. Bring to boil and simmer for 1 hour. Pour the soup into a blender (or use a hand blender if you don't have one) and blend until smooth. You may need to do this in batches if you have a small blender. Pour it back into the pan and add the tomato puree. Simmer for 5-10 minutes. If you like your soup really smooth and without a few bits of skin and tomato seeds, then you can strain the soup through a sieve (scraping the underneath so it comes through easier). But, this is a fairly lengthy, and boring, process and seeing as I don't mind the seeds and skin, I don't think it is worth doing, but it's up to you. What is your favourite family recipe? Comment below. This soup looks so flavoursome and delicious! comfort food! love the recipe, I love that you used potato for making it creamy! Tomato soup is my faaaaavorite! I love the idea of using the potato to make it thick without having to add lots of cream! Why does this look so creamy? Yum! I don’t normally love grilled cheese but this looks like it has a good depth of flavors so it won’t feel like I’m eating warm ketchup 😉 now I really want a grilled cheese! Mmmmmm, love creamy tomato and basil soup! It’s such a comfort food for my wife and I… especially with a grilled cheese!!! Nothing to me is more comforting than a big bowl of steaming soup. This sounds fabulous and perfect for the cooler weather we’ve recently been having! Tomato soup is my favourite too, but I can never get mine to taste like my mum’s either. They must have a secret ingredient. This looks really good. I’m going to give it a go at the weekend. Do you have just a bowl of soup for a meal or do you have something else with it? I made this last night using your recipe and it was delicious. The whole family enjoyed it too. We had it with hot bread fresh from the oven (not the healthiest) and it was very comforting. Thanks for the recipe. Love a nice bowl of soup and tomato and basil sounds (and looks) perfect. This is one of my fav soups. Hearty , simple yet delicious. Never bought a “tube” of tomato paste. Is it usually in local grocery stores? Lots of sodium? Can I used canned? If so, how much.